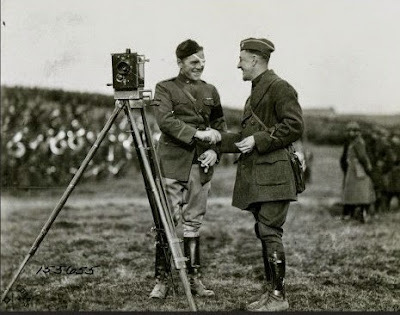 We only mentioned him briefly in our latest book on the American cinematographers of the First World War but he deserves some special attention on our weblog: Lt. Nicholas McDonald. Here you see him filming an American artillery barrage northwest of Verdun in October 1918. A photojournalist for the Chicago Herald & Examiner, McDonald was a good friend and a close colleague of Wilbur Durborough. He became a cinematographer in 1915 and made official pictures of the Canadian Army. The next year, while working for the Selig-Tribune newsreel organization, he covered the attack by General Pershing's forces on Pancho Villa in Mexico. After the American entry into the European war, he was attached to the 1st Division as a Lieutenant of the US Signal Corps photographic unit for that Division. Later, General Pershing promoted him to Captain and assigned him to GHQ of the American Expeditionary Force. McDonald filmed at Chateau-Thierry, St. Mihiel and the Argonne offensive and twice received citations for bravery. President Poincaré awarded him with the Croix de Guerre. McDonald also covered the Peace Conference at Versailles in 1919. 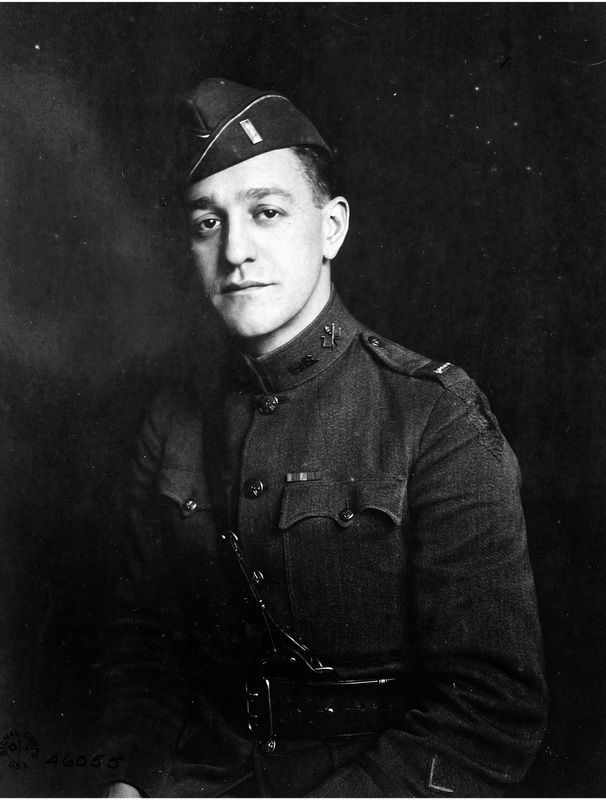 He reportedly did most of the principal photography for the feature film Pershing's Crusaders that was released by the Committee on Public Information in 1918. Here you see him together with another famous war correspondent from Chicago, Floyd Gibbons of the Chicago Tribune. In June 1918, at the Battle of Belleau Wood, Gibbons had lost an eye after being hit by German gunfire while attempting to rescue an American soldier. After World War I, McDonald worked for Walter Niebuhr's American Cinema Corporation, which we also mentioned in our book. 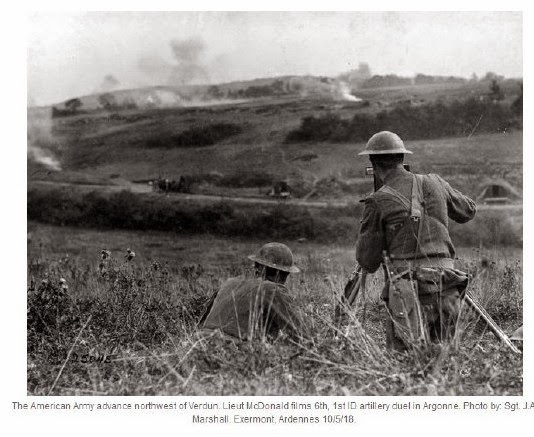 The International Association for Media and History (IAMHIST) has asked us to attend the upcoming conference in Bloomington, Indiana, and present our recent research material on the American film legacy of World War I. The theme of this conference is "Media & History Revisited" and will focus on the influence of digital media on film historical research. 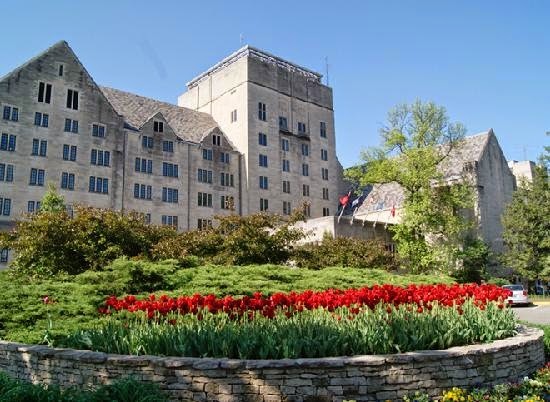 The conference is at the Indiana University Memorial Union in Bloomington from June 17-20. On June 18, between 11-12.30 AM, Cooper Graham will attend a session on key figures in media politics, and present our latest film historical research on the Irish nationalist, Sir Roger Casement. This session will be in the Persimmon Room of the Indiana University Memorial Union. The next day, on June 19, both Cooper Graham and Jim Castellan will attend a session in the Maple Room between 11-12.30 AM. Jim Castellan will explain about the way he used online surrogate sources to document Wilbur Durborough's World War I film On the Firing Line with the Germans (1915). Cooper Graham will give a presentation on the online research to trace the mysterious Donald C. Thompson, a war photographer from Kansas. Finally, Ron van Dopperen has prepared a presentation on the reconstruction of Albert Dawson's life and work as a film correspondent during the Great War. Ron can't make it to fly over to the USA but true to the conference's theme he will log in through Skype and attend the conference online. For more information on the international conference check out the IAMHIST website.